Apart from the quintessential eats like Belgian chocolate, waffles, fries and beer. There is the must have item that towers them all. Belgian Mussels – Belgium’s national dish. Moules Frites they call it, meaning Mussels and Fries. The approximately 1.5 kilogram serve will have you bursting at the seams yet you will still find yourself gorging your way through, suckling each and every shell. Waste not want not. They’re not little pissy ones either. You can see these mothers from out of space! Belgian mussels can be prepared in a variety of ways. You can have them with white wine, shallots, parsley and butter. Or simply steamed with celery, leeks and butter. My favourite is when they prepare it with white wine, cream and garlic. Otherwise you can have it with Belgian beer instead of white wine. Mussels typically can fetch up to the 30 euro – 50 euro mark, after all we in Belgium. Not cheap! The two places that I tried Belgian Mussels, came highly recommended to me by Belgian locals and rated as great value (approx 25 euro) and extremely good. 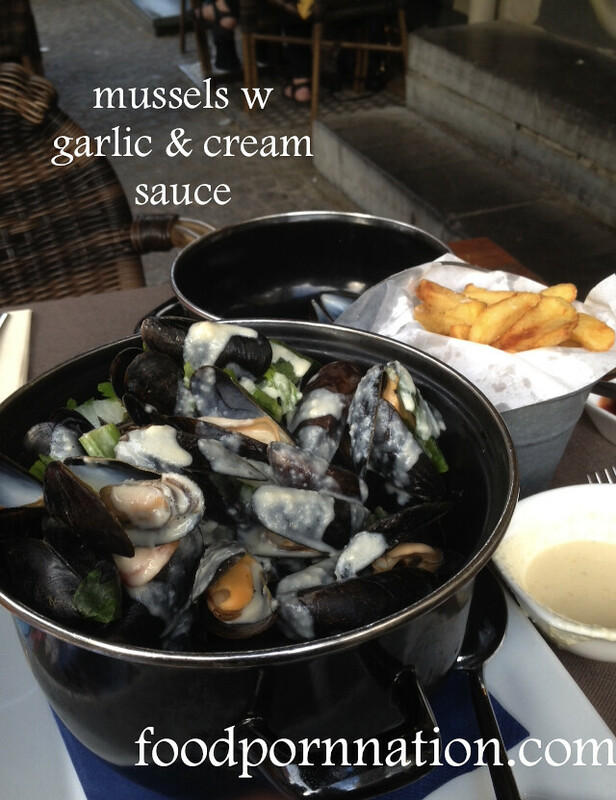 I am talking “these are the best mussels of my life, type of good and I would come back to Belgium just for these. In Bruges, I ate at Poules Moules. This is located right off this cute little square, it’s quaint, quiet and cosy. Great if you want to get away from the hustle and bustle of all those tourists! Service is great too and of course the mussels are divine! I ordered the mussels in white wine, with garlic and cream sauce on the side. (Pictured above). In Brussels, I went a bit off the beaten track to get this spot called Et Qui Va Ramener Le Chien (translation – So Who’s Going to Bring the Dog Back?). This is definitely no where near the tourist traps found around the main square of Brussels. You will appreciate this if you are ever in Brussels. Rue de Rollebeek is a street well known by locals. It’s a gorgeous quiet and windy street filled with cute little bars and restaurants. I got the special of the day, Mussels with white wine, garlic and cream. Mussels in Belgium – are in season from September – February, so time to mussel up.